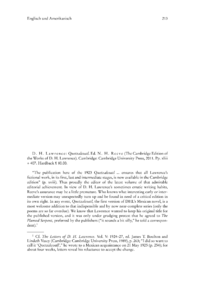 The publication here of the 1923 Quetzalcoatl ... ensures that all Lawrences fictional work, in its first, last and intermediate stages, is now available in the Cambridge edition (p. xviii). Thus proudly the editor of the latest volume of that admirable editorial achievement. In view of D. H. Lawrences sometimes erratic writing habits, Reeves assurance may be a little premature. Who knows what interesting early or intermediate version may unexpectedly turn up and be found in need of a critical edition in its own right. In any event, Quetzalcoatl, the first version of DHLs Mexican novel, is a most welcome addition to that indispensible and by now near-complete series (only the poems are so far overdue). We know that Lawrence wanted to keep his original title for the published version, and it was only under grudging protest that he agreed to The Plumed Serpent, preferred by the publishers (it sounds a bit silly, he told a correspondent).